Jaber Mousavi, S., Mohammadi Zia, F. (2011). Large Hydatid Cyst of Ovary A Very Rare Case Report. Iranian Journal of Pathology, 6(2), 93-96. Seyed Jaber Mousavi; Farzaneh Mohammadi Zia. "Large Hydatid Cyst of Ovary A Very Rare Case Report". 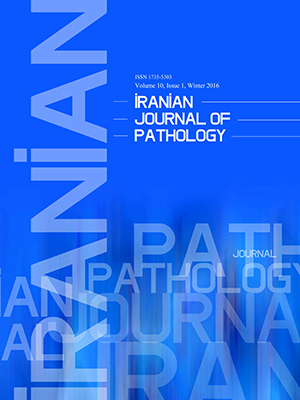 Iranian Journal of Pathology, 6, 2, 2011, 93-96. Jaber Mousavi, S., Mohammadi Zia, F. (2011). 'Large Hydatid Cyst of Ovary A Very Rare Case Report', Iranian Journal of Pathology, 6(2), pp. 93-96. Jaber Mousavi, S., Mohammadi Zia, F. Large Hydatid Cyst of Ovary A Very Rare Case Report. Iranian Journal of Pathology, 2011; 6(2): 93-96. Human hydatid cyst is a wide spread disease. It is an endemic disease in Iran. Hydatid cyst is extremely rare in the female reproductive organs. This is a case report of ovarian hydatid cyst in a 42-year-old woman. She presented with feeling of enlargement of abdomen and abdominal pain. On physical examination, a large mass in lower abdomen palpated. Ultrasonography reported a heterogeneous multicystic mass measuring 155×97 mm in hypo gastric area. The CT-scan with IV contrast reported a huge cystic lesion, containing multiple septi that could be due to ovarian lesion. After surgery, histopathological examination showed typical laminated &germinative layers with hexagonal scolecies of hydatid cyst. Since the common sites of hydatid cyst are liver, lung, etc and the imaging studies are highly diagnostic for hydatid cysts; this illustrated case is interesting for uncommon site, not suggested by imaging studies and with clinical (surgical) impression of malignant ovarian tumor.